There is another similar utility called CyclicBarrier, which can also be used in this situation, where one thread needs to wait for other threads before they start processing. Only difference between CyclicBarrier and CountDownLatch is that you can reuse the barrier even after its broker but you cannot reuse the count down latch, once count reaches to zero. Mastering Concurrency is not easy but if you seriously wants to become an expert Java programmer, you got to tame this horse. One thing which can help you in your journey is the Brian Goetz classic, Java Concurrency in Practice. One of the most recommended book for Java programmer. How to use CountDownLatch in Java? Theory is easy to read but you cannot understand it until you see it live in action, this is even more true with concurrency and multi-threading. 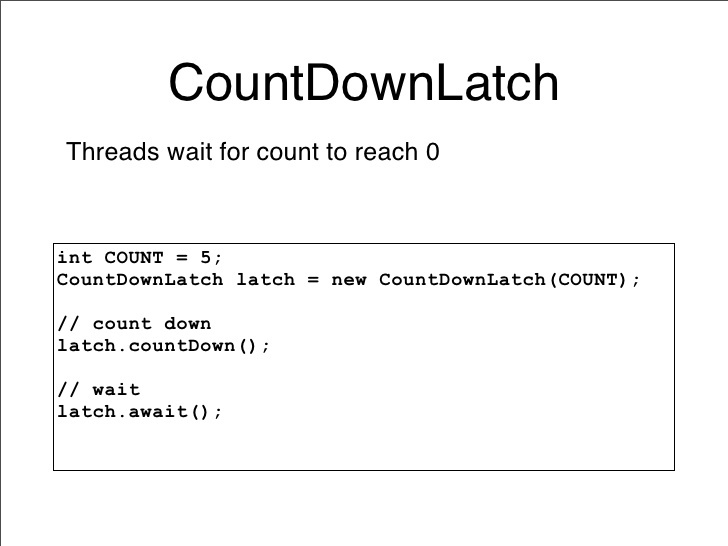 So let's see how to use CountDownLatch in Java with a simple demo. In this example, we have a main thread which is required to wait until all worker thread finished their task. In order to achieve this, I have created a CountDownLatch with number of count equal to 4, which is the total number of worker threads. I then passed this CountDownLatch to each worker thread, whenever they complete their task, they call countDown() method, once last worker thread calls the countDown() method then the latch is broken and main thread which has been waiting on latch start running again and finished its execution. In order to truly understand this problem, you first need to run by by commenting latch.await() call in main method, without this call main thread will not for any worker thread to finish their execution and it will terminate as soon as possible, may be even before any worker thread get started. If you run again by un-commenting latch.await() then you will always see that main thread has finished last. Why? because await() is a blocking call and it blocks until count reaches zero. Also, you cannot reuse the latch once count=0, calling await() method on latch will have no effect i.e. thread will not block, but they not throw any exception as well, which is little bit of counter intuitive if you are expecting an IllegalThreadStateException. 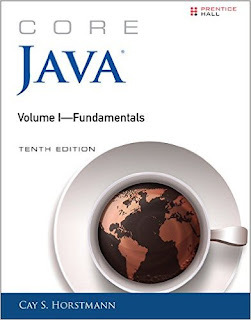 You can also check Core Java Volume 1 - Fundamentals by Cay S. Horstmann to learn more about these higher level concurrency utilities introduced on Java 1.5 release. * needs to wait for other threads before starting its work. This is where CountDownLatch is different than CyclicBarrier because you can reuse the barrier to stop the thread even after barrier is broken. 1) When you create an object of CountDownLatch you pass an int to its constructor (the count), this is actually number of invited parties (threads) for an event. 2) The thread, which is dependent on other threads to start processing, waits on latch until every other thread has called count down. All threads, which are waiting on await() proceed together once count down reaches to zero. 4) Once count reaches to zero, countdown latch cannot be used again, calling await() method on that latch will not stop any thread, but it will neither throw any exception. 5) One of the popular use of CountDownLatch is in testing concurrent code, by using this latch you can guarantee that multiple threads are firing request simultaneously or executing code at almost same time. 6) There is a similar concurrency utility called CyclicBarrier, which can also use to simulate this scenario but difference between CountDownLatch and CyclicBarrier is that you can reuse the cyclic barrier once the barrier is broken but you cannot reuse the CountDownLatch one count reaches to zero. 7) Java 7 also introduced a flexible alternative of CountDownLatch, known as Phaser. It also has number of unarrived party just like barrier and latch but that number is flexible. So its more like you will not block if one of the guest bunks the party. 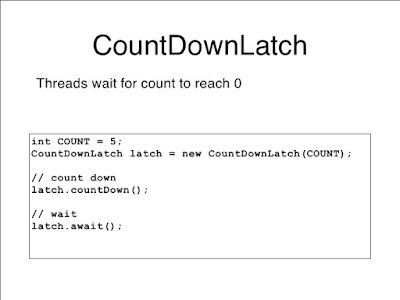 That's all in this Java CountDownLatch example. In this tutorial, you have learned how to use CountDownLatch in Java to make sure your key thread starts processing once all pre-conditions are full-filled or when all threads are ready. There are two other similar utility, one is called Phaser and other is called CyclicBarrier, if you want a dynamic count, go for Phaser and if you want to reuse the barrier again and again, go for CyclicBarrier. We will see examples of this two synchronizers in Java in our next Java Concurrency tutorial. Here you can find my article where in the example code you can see use of CountDownLatch to wait for specific websocket messages. Maybe someone will find it useful. statement for "started" for all workers should be printed before "finished" statement. But it's not happening in above example. Since latch.await() is being invoked from inside the main() method means it's main() method which awaits count to become zero. And not the workers thread which have to await. They just invoke countDown() method to decrease the count by 1 for each invocation. Hence the Worker threads are free to complete and thus printing "finished". Hope this answers your question. does it imply that the main thread is not waiting for the countdown to reach 0 before proceeding? No, main thread will only continue after all thread called the countDown() method i.e. when count reaches zero. It's just that print statement comes after calling countDown() method and that delay is enough for main thread to proceed. If you put the print statement above calling countDown() method in run() method of Worker thread, you will see the output you want.